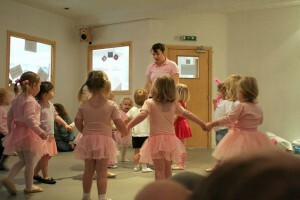 Baby ballet class can be both frustrating and challenging for a dance teacher, but if you plan it right, it can be an absolute breeze – well not really, but you can get as close to perfect as you can with that age group. When planning a baby ballet class, you need to come up with a theme or story that you can tell them. Trying to launch into a series of plies and tendus for this age group will prove fruitless, and they will lose interest and in some cases become uncontrollable. Once you have a story for your baby ballet class, the next thing to do is think of steps that will incorporate basic dance technique into your theme. For instance, within your little adventure, you could test the water with your big toe, thus teaching them to point their feet. You could fly on a plane, and at the same time teach them to run on demi-pointe (on the balls of the feet). You need to do this in such a way that they are learning the correct basic ballet technique, without realizing that they are actually learning something. In other words, you need to make your class a whole lot of fun. Your main aim should be to encourage those little ones to grow a love for dance, look forward to each and every lesson, and give it their all when they are there. As you go through your class, try to keep it moving, as little ones get extremely bored very fast if allowed to do the same thing for too long. Do something sitting, then stand and do something that moves, then play a game, then sit again and so on. You can grab some great ideas on this Baby Ballet DVD. Finding exciting music is just as important for your baby ballet class. Try to use music that they will identify with. Barney, Frozen and whatever the latest movie of the moment is usually working well for me. Using music from things that they see on TV or at the movies will make them respond a whole lot better than simply playing the same old piano music throughout the entire class. Try to vary the music between instrumental and something with vocals in it. There is no excuse for boring music, as nowadays there is so much that you can purchase online for a fraction of the cost that you would pay in a shop, like the DVD to the left which gives a lovely variety of music that any young child will love. But even if you do buy this music, vary it by mixing it with other sorts of music, or the class starts sounding monotonous once again. The music to the right will add some spice and fun to your ballet class, and you can mix it with all sorts of other music for variety. This music is an entire ballet class, starting with plies and working right through to grande allegro. (although you don’t want to make it quite so technical for the littlies). The music is still instrumental, but with all the well-known songs that everyone knows and loves. This one may be a bit old for baby class, but there are certain pieces that they will love. You can also buy the individual tracks if you don’t want the entire CD, which is great because then you don’t end up with a lot of songs on your hard drive that you don’t use. Click here to read about Adventures In Pre School Dance. I have included some ideas on this website under Pre-Ballet Lesson Plans. Never underestimate these little ballerina’s, because if you do they will eat you alive. You may think it is easy to do a class of three-year-olds, but just the opposite is true. You need triple the energy than you would for an older class and ten times more patience. Constantly change the mood of the class. You can do this by whispering one minute and speaking loudly the next. Try drawing them in like you want to tell them a secret, especially if you need their attention. Make it sound like it is going to be the best secret ever. Choose one of your pupils (usually the naughty one) to be a ballet doll. Tell the others that they are not allowed to touch the ballet doll. Only the teacher can touch the doll. Tell the others the ballet doll is going to help you to teach them a new step. Put the doll in a ballet position and discuss with the students the right and wrong ways in which to do the step. Let them take the lead sometimes. Try let them make up some of the stories and think up some ballet steps that they can do that will relate to it. Offer them options from time to time, like – would you like the fairy to come to tea, or would you like to go into the woods? It is a nice break from being told what to do all the time. If they really are misbehaving, tell them it is time to sit down and have a chat. Here you can lay down the rules and ask them what rules they think they should have for the ballet class. Don’t shout at them, rather be gentle but firm and direct, but still caring. You could also let them know whose job is whose. Ask them who the teacher is and what her job is. Then say whose job is it to learn ballet. Ask them if the teacher will be able to teach them ballet if they are making a noise. These are just some of the tips and tricks I use when teaching my baby ballet class, and most of the time they have worked well for me. Please feel free to comment below if you have any other ideas to add. Men In Ballet - Should I Let My Son Dance?